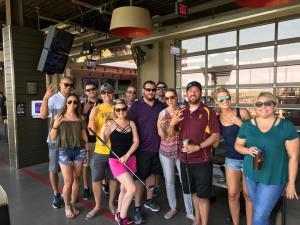 The Sun Devil Club Young Professionals Group (YPG) is a membership-based organization for Arizona State University alumni, fans and donors, ages 21 to 40. 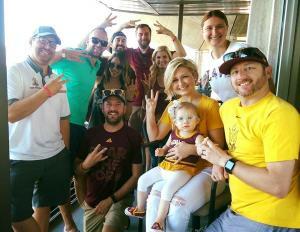 Its members are often your "die hard" Devils; they bleed maroon and gold and are looking to build a stronger affinity for Sun Devil Athletics by giving back through philanthropy and collaborative engagement. The SDCYPG offers networking opportunities and several unique, fun, and engaging events throughout the year, some of which include the popular Devils' Ball, an annual golf tournament, and home-game football tailgates! Membership dues are $25/month ($300 annually) for individuals or $30/month ($360 annually) for families; dues help support the Sun Devil Club and Sun Devil Athletics. The main goals of the group are to help support the Sun Devil Club and Sun Devil Athletics by investing in the future of our student-athletes, grow the membership base of YPG, and become part of a fun, passionate group of Sun Devil supporters. For more information about the Sun Devil Club Young Professionals or joining the group, please contact Keith Flyer at Keith.Flyer@asu.edu. Sign up to pay your membership dues using this link.